Deeper in, the valley opened onto a small clearing with an established campsite. 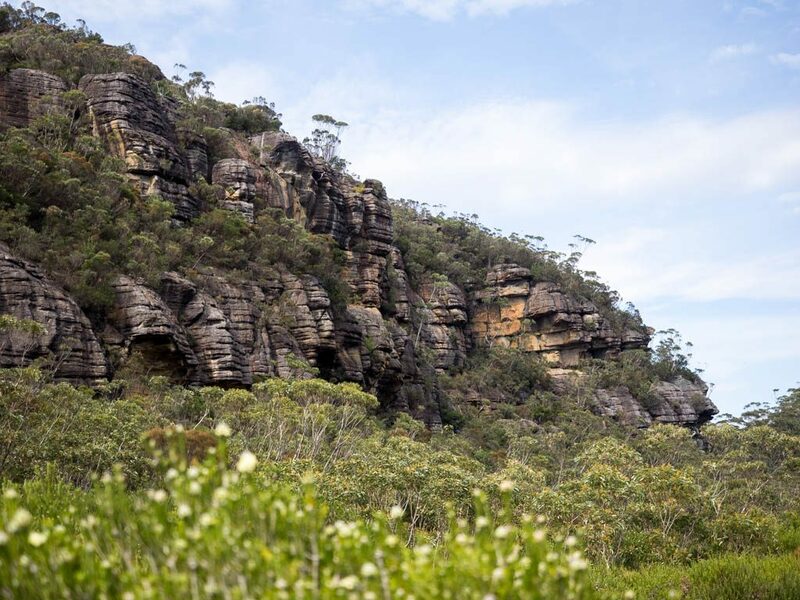 Tall cliffs, banksias and ancient gums rose mutely around it. Both Dad and I stood in awe of this place. To stay here overnight felt like an act that would have bordered on the profane. There was an immanence here that I have rarely felt in my years of bushwalking. I could only imagine how important this place must have been to the generations of aboriginal people who came here before us. That said, there were no visible signs of indigenous occupation (to my untrained eye at least), unlike the bora circle further north on Mt Quilty. Camping is also now discouraged here due to the Hidden Valley’s ecological sensitivity. 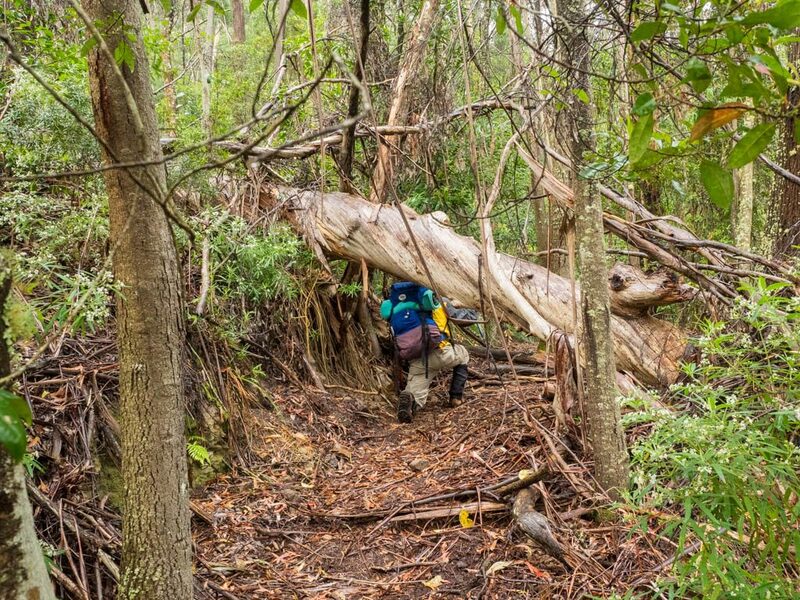 Seeking out Dark Brother’s Cave, we followed a trail into swamp and then thick scrub. The trail petered out quickly and we found ourselves engulfed by leaf, flower and branch, following a faint line of weakness. I had stupidly missed the semi-established path, which follows the western side of the valley. 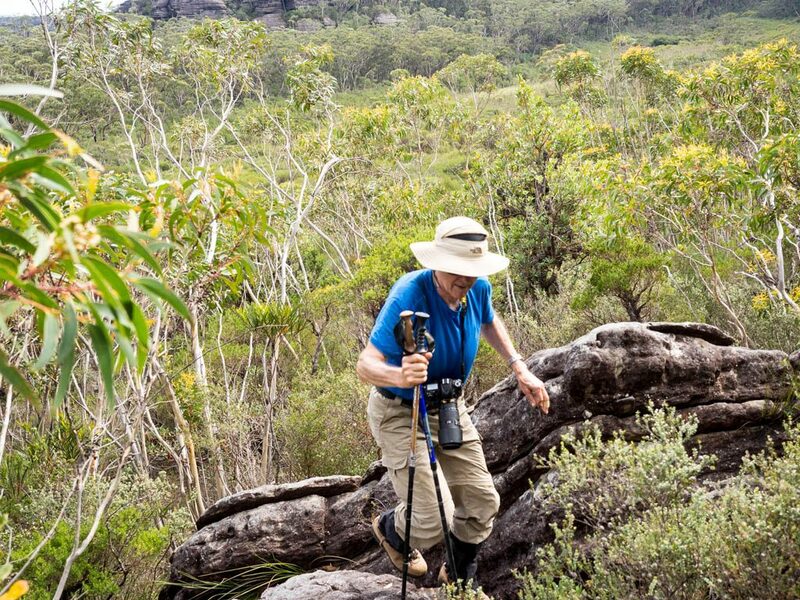 After a solid bout of bush-bashing we managed to find our way to the base of Mt Sturgiss’s cliffs, and hopped between boulder islands in the scrub. With relief and a loud holler, I finally spotted a cairn, marking the route up. A short scramble later, we sat in the cave – a cavernous space underneath a massive stone overhang, adorned by a couple of rough stone benches and a fire scar. 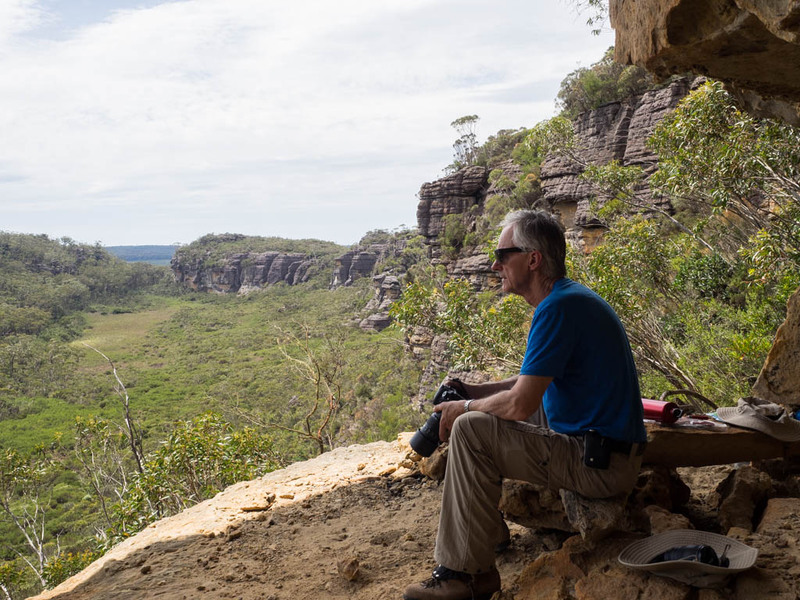 From here we could appreciate the valley’s full extent and seclusion: scrub tapered into swamp terrain on the northern side and was enclosed on all sides by eroded sandstone cliffs. Their rounded features were as expressive as the stone carvings of gods at Ankgor Wat. After lunch, I left Dad and followed the exposed cliff line towards Mt Sturgiss’s summit and the route for a potential traverse across the mount towards Folly Point. 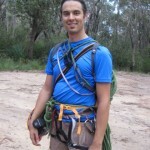 Using a bolted chain, I pulled myself up a 2m rock face, and then shuffled across an airy traverse. The guidebook had warned that this traverse was exposed in parts: it wasn’t wrong. At times, I was edging along a thin ledge with a 50m+ drop below me. With solid hand holds, it was secure enough but a head for heights was critical. I felt especially exposed on my own. Eventually I reached the end of the traverse from where a short scramble up a 30deg slab led to the summit plateau – the access point for an off-track route to Folly Point further East. I’m a confident rock climber but on my own, wearing clunky hiking boots I decided against ascending further: there was no margin for error. One slip and Dad would not know where I had landed. I retraced my steps back to the chain. Not trusting my boots, I decided to go bare foot. I dropped one boot down to the floor below and watched in horror as it ricocheted off the rock face, towards the cliff edge. There it came to rest, caught only by a small shrub’s branches. Lesson learned. That afternoon clouds closed in; there would be no sunset to light up the tabletop mountains overlooking the Styles Creek plains. Exploring south towards Mt Hoddle, we walked through low-lying heath, past a variety of pultenaea (pea flower) and isopogon (drumstick) species that I hadn’t seen before. On the way back, rain set in. 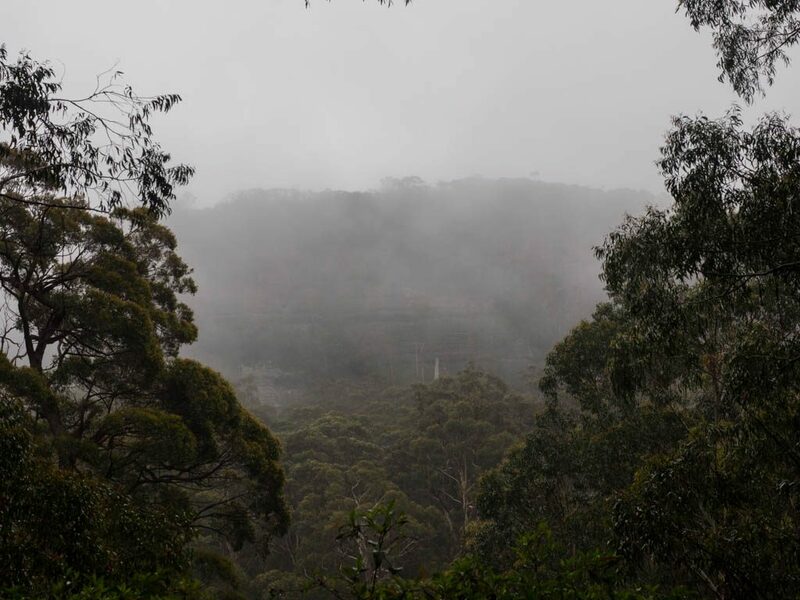 We cooked and ate quickly and rose to a misty eucalypt forest. As we packed to go a group of four walkers arrived. They walked off, along the Hidden Valley trail, and we started home. A constant drizzle enshrouded us, a welcome change to the first day’s heat. 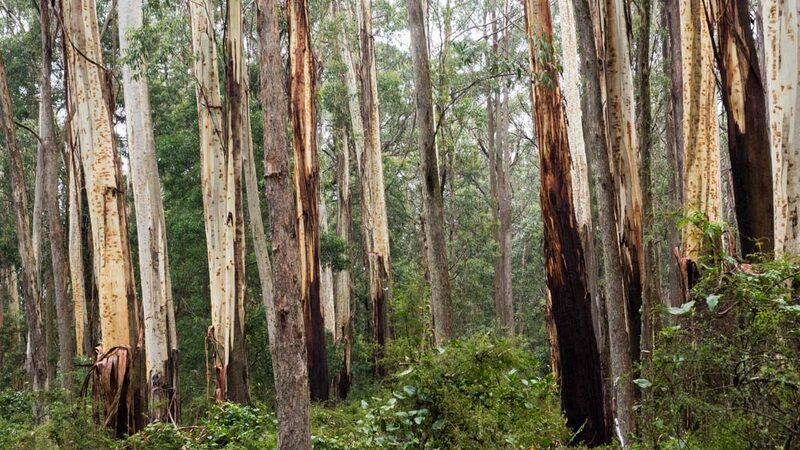 In the still air it clung to understorey leaves and flowers, and polished the exposed trunks of white ash (Eucalyptus fraxinoides) from which bark had peeled away in ribbons. The glimpses of Mt Quilty we had on the walk-in were now almost a white out, with only the mount’s outline visible. 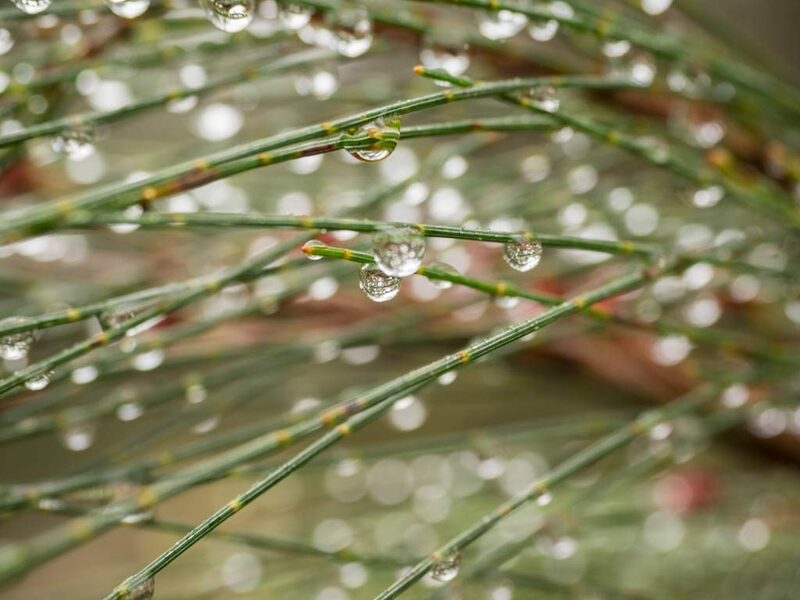 It was sweet to take our time on this leg of the walk, revelling in the beauty of small things: the luscious texture of moss and lichen; rows of wood fungi on fallen trees; perfectly formed water drops on the petals of an isopogon or spine-like leaves of a casuarina. We moved slowly, taking dozens of photos, amazed at the dream-like stillness of the sodden landscape around us. 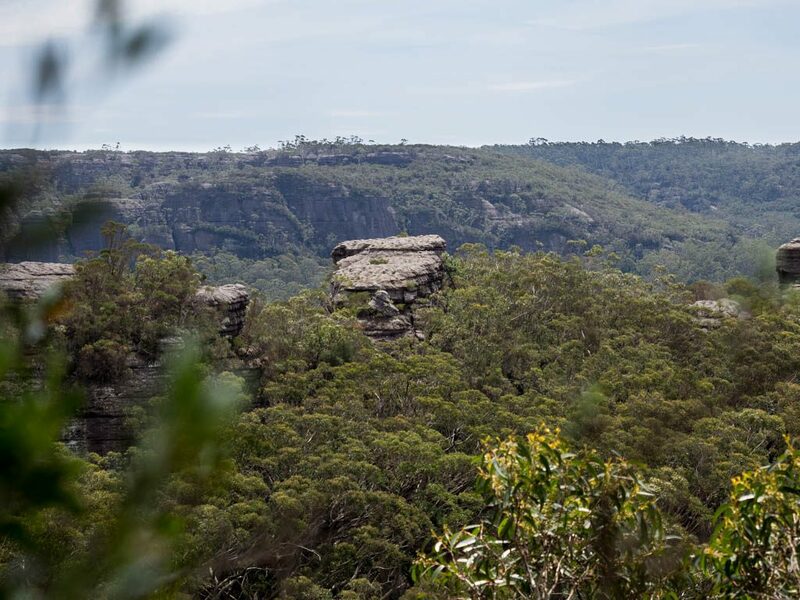 So slowly, in fact, that the four walkers overtook us as we stopped for lunch at Camp Rock – another pagoda-like sandstone formation where a rock overhang made for a perfect campsite (though there was no reliable water source nearby). Even the ridge-top heath country was more bearable, thanks to the mystery of mist and cool air. After storing the camera away once and for all (‘Last photo, OK?’) we eventually arrived at the Sassafras picnic area where the group was eating a late lunch. 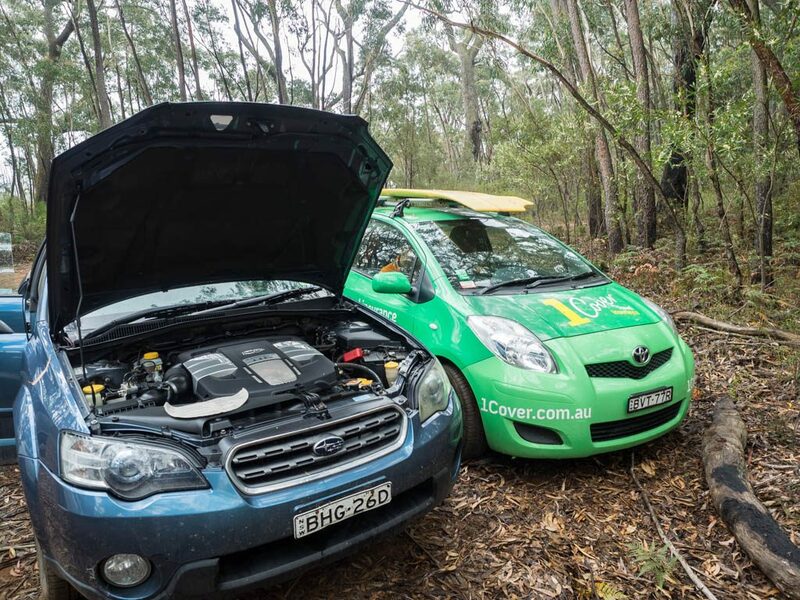 Lucky for us that they hadn’t left because when we tried to start the car the battery was completely dead. A small internal light left on for a few days was the root cause. After a moment of panic, we flagged down Gregory just as they were about to depart in his 1Cover-branded hatchback. My dad had jump leads in the boot and we were soon good to go. 1Cover to the rescue! Thanks Gregory. ‘1Cover is always there when you need us,’ joked Gregory, as he closed the bonnet. ‘I’ll be sure to blog that,’ I replied, smiling with relief… With the main road a solid couple of hours walk away, we had gotten off lightly; me so doubly after nearly losing my boot over a cliff. It was a reminder of just how isolated the Budawangs are. It is a place to come bearing respect: this is a wilderness that can both transform and be transformed by us. Ducking under a fallen tree on the bush trail down from the Hidden Valley campsite – apparently this used to be used by timber millers: a hard slog! I’d really appreciate any help you could offer! Hi Corinne. I highly recommend a trip to the Hidden Valley. 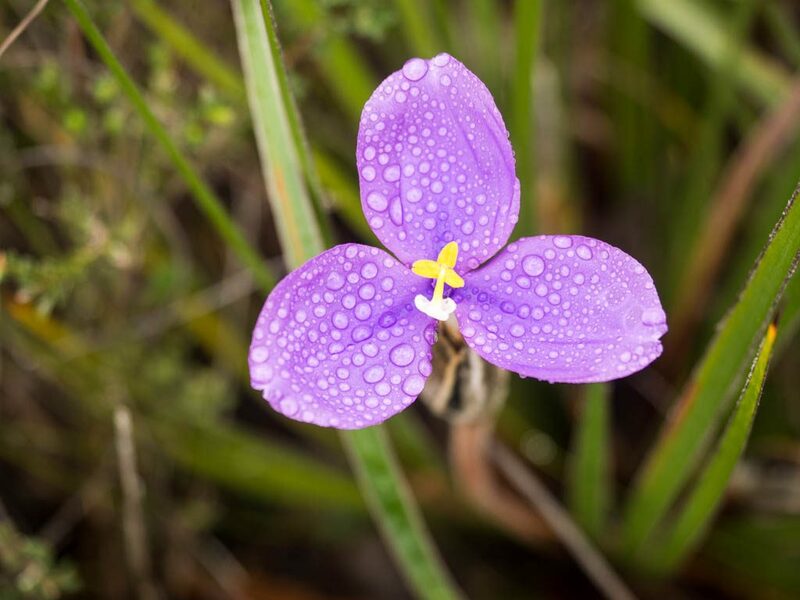 Thanks to the efforts of many bushwalkers, it’s not that hidden anymore. I don’t have any GPS coordinates but the turnoff is really quite easy to find: as you climb out of the Vines’ last rainforest gully, you come up onto a flat, forested section. You follow that south-west for about 1km. The turn off is from a clearing, which is where we camped. You’ll recognise it by the large fallen log on the left of the track and a tall tree fern. The tree fern has the initials HV carved into its trunk. You follow that track east for another km. Then you’ll be in the valley. 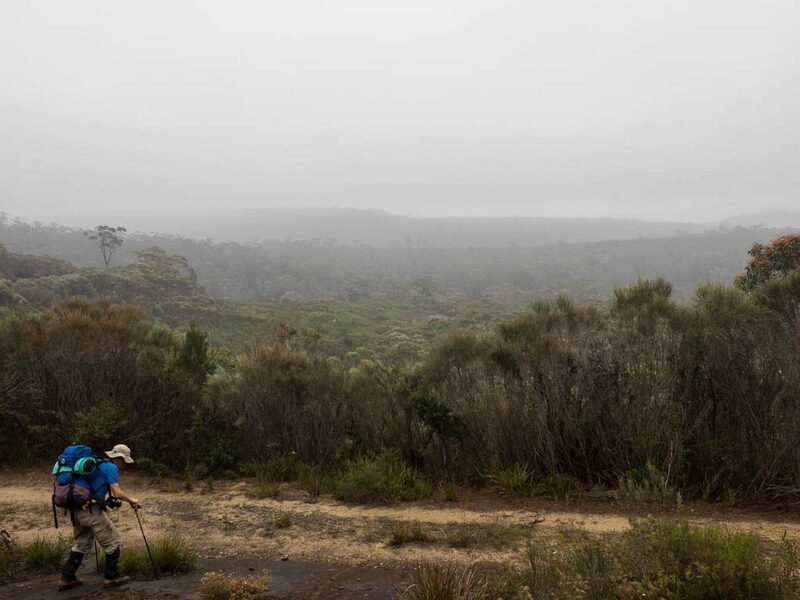 You can see a photo of the campsite/turnoff on my photo in Part 1: http://thelifeoutdoors.com.au/hiking/into-the-hidden-valley-walking-the-budawang-range-part-1/. Finally, it’s marked on the Land and Property Management Authority topo map (Endrick 8927-4S) which you can download for free. Let me know if that answers your question.